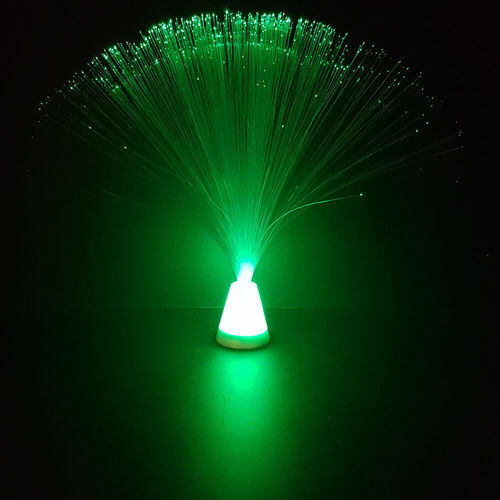 Fibre Optic Lamp | A spectacular light for parties and table centrepieces! Bright morphing colours to liven up your room! That light up like a sparkling star! If you're looking for cool party essentials the mini Fibre Optic Lamp is just the thing you need to set the mood! This cool mini portable lamp has hundreds of long optic fibres that fan out in all directions. Turn it on and the fibres will emit a cosmic morphing glow as hundreds of tiny lights branch out from the base to produce a sensational high! It makes for a fantastic party decoration, and kids love to run their hands over the fibres when used as a night light! It's also a great tech toy for geeks and makes an awesome present for teenagers or a cool office toy. Please note: These lamps change colour from red, green & blue and all the shades in between. Includes 3 x LR44 replaceable batteries. Bases are available in three colours - (each sold separately) - (make your selection above).Height from bottom of stand to tip of the highest fibre optic strand is approx - 22 cm. Very quick delivery, no hassle ordering. Would recommend Coolthings to all.